Would you ever associate the word “freedom” with cork handbags? I probably wouldn’t either. But that’s the word that came up over and over again in the brand strategy workshop with handbag designer, Paula Parisotto. I quickly realized that “freedom" was the thread that would tie the entire brand together. This was the first client that I ever found just one word to describe the brand and I wasn’t even looking for it. We had already gone through 4 hours of our strategy workshop, identifying Paula’s ideal client persona along with the customer journey, and now were onto the brand portion. During this part of the workshop, we listed out brand attributes, picked a brand archetype, and then dug into Paula’s story—her "why" for starting to design cork handbags. As Simon Sinek says, “People don’t buy what you do, they buy why you do it.” So to find that golden nugget—the reason Paula does what she does—we’d have to go back… wayyyy back, all the way to her childhood up until the present moment. I’ve learned that our “why” for doing things is usually planted in us at an early age, even if it’s just a spark that develops over time. I’ve also found that as someone describes their story, their mind is drawn to particular milestones and certain words in describing their past that end up having a major theme. When people tell stories, I believe there are hidden messages, almost like code from their subconscious that surface and can be seen if one is paying enough attention. And if there is one thing that gets me excited, it’s observing, listening, and recognizing patterns. Although there were already hints to the theme earlier in the workshop, this part tied it altogether and we both had that ah-ha! moment. You know that feeling of discovering something that was there all along, right in front of your face?! It’s so incredibly satisfying. As Paula described her past, she told me stories of her childhood, her major life transitions and career changes, her passions, and her desires for the future. I just kept asking questions, not even really knowing what I was looking for. I knew that something would surface, I would just need to be paying close enough attention to be able to identify it. As she continued to share, I took notes, and kept an eye out for what I now call the golden nugget—the one major theme that ties everything together. Paula wanted to design a handbag that had the versatility and durability to go to and from any environment (from work, to the beach, to a night out, etc) and fit just about anything. She said she wanted to give back to veterans and that she was a huge supporter of those who protect our freedom. Having her handbags made in the USA was extremely important to her. She’s all American and proud of our country. She believes that women have the freedom to choose to pursue their dreams. As she talked, story after story, I had to stop her. Her eyes lit up and I could see her retracing everything from the day (we were already on hour 7 of an all-day strategy workshop). She 100% agreed and I could sense a feeling of excitement. We found the golden nugget! 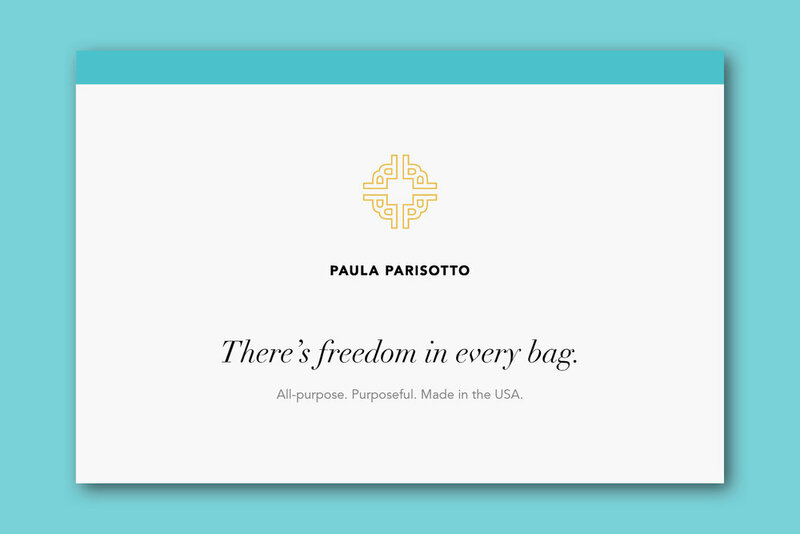 “Freedom” ended up being the one word that gave life and inspiration to her brand—from messaging, to design, to photography—freedom would be woven into the DNA of the Paula Parisotto brand. Before switching from being a graphic designer to a brand strategist, I never realized that the one thing I was missing the most was the human connection with my client and helping them discover something about themselves. It’s not solely about building a great looking brand (although that’s definitely a major goal), it’s about my client on a personal level. They need to feel confident in their brand, their story, and their "why.” They need to have the ah-ha! moment. Without it, they’re left at the mercy of so called experts telling them what to do with their brand and not really feeling connected to anything said expert proposes. When business owners are connected with their brand at it’s core and have a solid sense of direction and clarity, they will have the motivation to see to it that they meet their goals. They’ll have the fuel to hit the ground running because they know who they are, who their brand is, and how to move forward. And that’s exactly what Paula did. Get my top 3 questions to uncover a brand’s one word. Sign up for the Strategy Stories Newsletter and get instant access to The Top 3 Questions to Uncover a Brand’s One Word PDF. .
Get my top 3 questions when you sign up for the Strategy Stories Newsletter.